What a blessing! 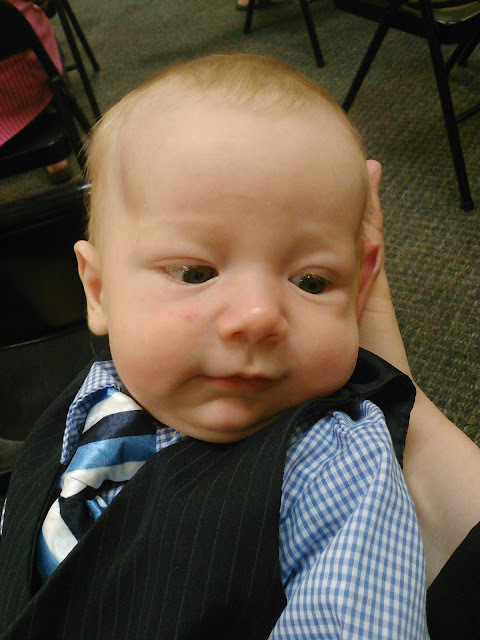 I love his little tie and vest for church. Adorable baby. I love his dress shirt, tie, and vest! Just looking at him reminds me of those precious baby heads resting under my neck as I hold them. Actually, I just noticed we are expecting again. Since we have 2 girls and 2 boys, maybe we'll let it be a surprise this time... I say that, but I probably couldn't follow through with not knowing- haha. It's hard to believe I'm really 'with child' for the 5th time and we'll hopefully be a family of 7 in 9 months. Something about getting to #5 feels like entering a new category or something- but maybe I'm just silly. He is so cute! He looks more like you Zsuzsa. Him and Anna do. You are right, you guys are spoiled! I know that all too well. Our little Joel lights up our home. Tell everyone hi. He's adorable and I agree children are the greatest blessing. Would love more. Just wondering..you have mentioned that you co sleep.Do you night nurse? When do your babies wean an how do you go about doing it? I co-sleep and the night nursing seems to keep my cycles away...that has been my pattern anyway. My LO just turned 1. He is just so great. The Lord has surely blessed you. Awwww....you need to update your family photo! I'm one of your anonymousie readers/commenters. Haven't been reading here, been too busy fainting, puking, crying "no more please, no more" and any related 1st trimester fun activities : ) We are past halftime now. I can totally relate to this post because Ours will be a boy, too. I adore girls, I totally do. Yours are very pretty too. Becky is a heartthrob, Miriam is a lady in every picture, showing an immense amount of grace for her age, and Annie... Annie is the perfect doll if there's ever been one. But I'm soooo happy it's gonna be a boy. I adore his Dad, he's so much better, cuter, sweeter, smarter than I am, I don't even know what he likes about me. I can't wait to kiss his toes, his tummy, thankfully he now already looks like his dad. Whew. I'll babysit little girls because He is going to be our only child, I'm risking my life carrying him. He's healthy, so far perfect but I won't risk another pregnancy, I don't want to leave this child motherless, I have serious issues, we thought I'd never make through the 1st trimester. There have been weeks where I was rushed to the ER 4 times. Now I'm only nauseous when I smell Indian food - me former favorite... And I'm craving sushi which is a no-no. Enjoy your baby. I'm hanging upside down kinda, all the blood is in my head. I can have 2 short bathroom breaks a day. But everytime I look at a boy like yours, I know what I'm doing. I'm wishing your family all the best. I have been reading your blog on and off with the last month approx since my husband Kevin put me on to it,he enjoys your husbands sermons. your blog is great it's very informative. Your little Stephen is Gorgeous me and my 3 children have just been smiling at him endlessly.He reminds me of my little boy Josiah who will be 6 months old this month a great little happy easy going smiler born happily at home too. Ye are truly blessed with your lovely 7 children. So sweet. Remember that idiot who said he was wishing for a miscarriage? What a Jerk. I'm so sad he doesn't see what a blessing children are. I don't think that person understood what he was saying. He can't say that now. 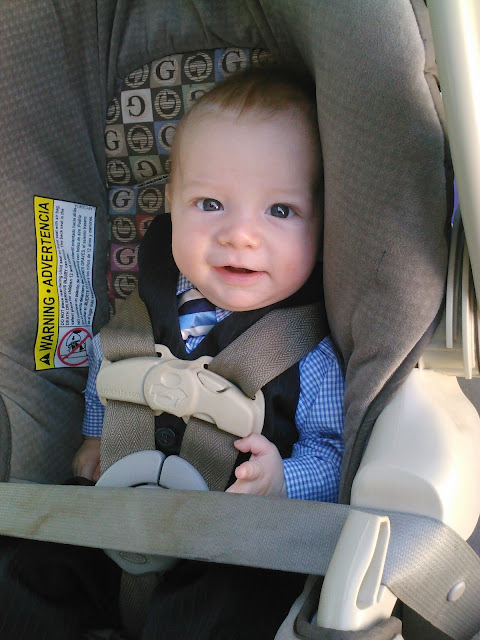 I don't know anyone who could possibly say what he did looking at baby Stephen smiling at them.